Many physicists have a moment they can point to as the moment they decided to study physics. Often it is a teacher, or an experiment, or a demo show that made them think physics was the most interesting and fascinating subject. Others might be inspired to follow the path of a favorite author or television character. For me, Dana Scully was that character. 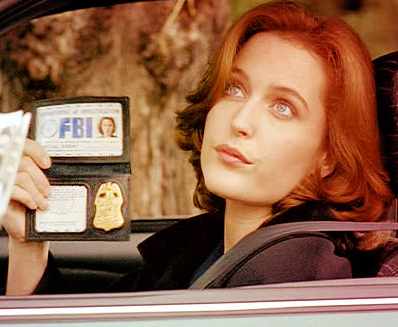 I grew up watching the X-Files and for the first time I saw someone like me (well, not exactly like me, I'll never be that well put together or able to walk in heels) as a scientist. For many from my generation she was the first time we saw a female lead on TV that was not a sidekick and was treated as a full and engaging character. She also happened to be a physicist. This made me feel like I could do that, too. It turns out I'm not alone in making career choices based on television shows: there's a well-documented phenomenon called the "CSI Effect." After CSI caught on there was an influx of students wanting to become crime scene investigators. TV made it look interesting and people chose to pursue it as a career. The effect of TV on career choice led to more police officers (Law and Order) and more doctors (ER). Today, if you ask people the reason for their chosen career in physics, most women say a high school teacher was influential. Men, however, cite a wide range of reasons, from sci-fi, to video games, to TV shows. This may be because there are just more role models for men to look up to. But in the 90's, people like me were lucky to have Dana Scully and Dr. Ellie Arroway to look up to. Clearly Scully was my personal role model. Last year when I heard X-Files was coming back, I was ecstatic and hopeful that a new generation of girls would see someone like themselves doing science on TV. As followers of the blog know, we go to Comic Con International every year. It can be very difficult to get into panels, but in 2013 there was an X-Files 20th anniversary panel, and darned if I wouldn't be in there. After sleeping on the sidewalk in line, I just managed to get in—fellow Buzz Blogger Quantum was nice enough to bring me Starbucks to wake me up enough to enjoy the experience. When they announced that we could get in line for questions, I threw a few elbows, used my mad kung fu reflexes, and got in line. To this day I have no idea how I made words escape my mouth, but I managed to get up to the mic, say that my question was for Gillian Anderson, and tell her that Scully inspired me to continue through my PhD in physics. The panel clapped for me for that, which was quite a moment. I continued on to ask whether or not she was currently part of any effort to get more women in STEM. She was directly involved, but also went on to talk about about how she got fan mail from people just like me who were inspired by her character. She said she had heard of something she called the "Scully Effect" that caused more women to go into physics during the run of the X-Files. If you want to see the whole panel, here ya go; my question is at the 46:00 mark. Being the scientist that I am, I set out to see if the "Scully Effect" was a real thing. What I found was interesting. I searched and searched for the source Anderson referenced in her answer but had no luck. In fact, I found no mention of the "Scully Effect" before this panel in 2013. None. Since then, however, its has been referenced in several news articles and Anderson herself has talked about it in subsequent interviews and panels. I found lots on the "CSI Effect" and quite about on how pop culture can affect career choice, and one horrible article that called Scully a "sidekick" but nothing about Scully specifically. 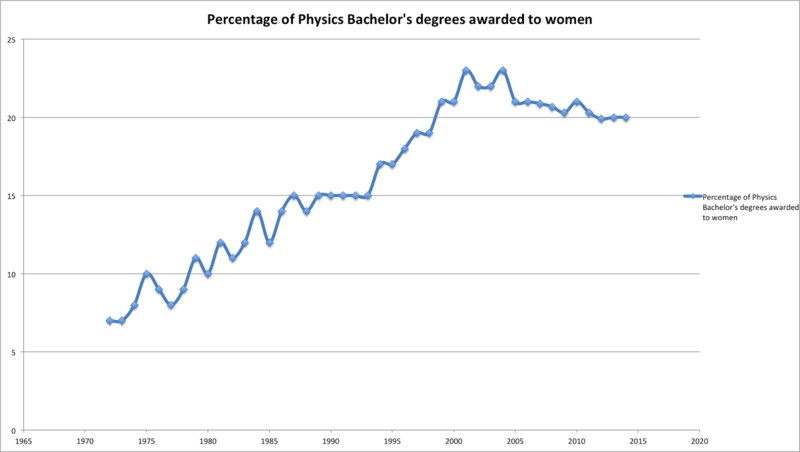 I had seen graphs of the percentage of women that majored in physics over time and remembered that there was a pretty significant bump during some time period. My next step was to hunt down that data and see how it compared to the success of the X-Files. Fortunately, the American Institute of Physics publishes data on the graduation rates and career choices of physics majors. They were nice enough to send over their stats from the early 70s through 2015 on the percentage of physics majors who are women. 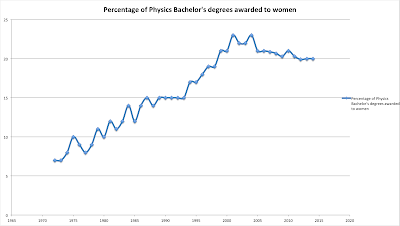 The percentage is more telling than actual numbers since the total number of physics majors has increased over time. Indeed, there was a bump in the data and the percentage of women was at its peak between 2001 and 2004. You can see a pretty clear jump in the 90s and early 2000s. The next question I had was how this compared to the success of the X-Files during that same period. I thought looking at the ratings was the best idea. 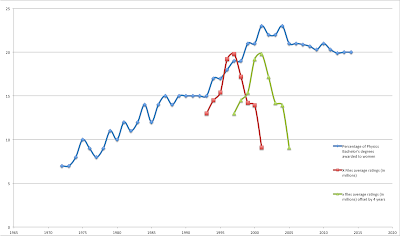 I graphed two things: X-Files ratings in millions during those years, and the same data shifted by four years. Since these are graduation rates, not number of declared majors, people that were inspired by the X-Files might not have shown up in the data for several years. Before reading too much into this graph, it is really just for fun and some neat data. All the cautions of correlation not implying causation apply. Take it with a grain of salt, but enjoy. It looks like one could argue that the Scully Effect might be real. For additional interesting information, the movie Contact came out in 1997, right at the red peak. I graduated college right at the green peak, when the possible "Scully Effect" was at its strongest. It would be equally easy to argue that the rise in women physicists in pop culture is actually the result of the increased number of women majoring in physics. This is a bit harder to argue since the increase in Hollywood representation doesn't lag the increase in majors as it should for this argument to hold. Still, the two effects might have amplified each other. People are still referencing the "Scully Effect," a term seemingly coined at Comic Con International, 2013 in Ballroom 20. The data seem to support the idea, though there aren't the extensive studies similar to those done on the "CSI Effect." If anyone is up for it, there's a second chance now, with the X-Files reboot—maybe this is the start of the next great boost to the number of women in physics. Is the "Scully Effect" real? lovely article -- yes I want to believe as well. What Happens Beyond "Absolute Hot"? Just What IS a "Quantum"?